The first question has essentially two possible answers – yes or no. However, it’s very hard to give a simple ‘no’ to the second question because it just doesn’t fit the question. The second question presupposes that, at some level, the person does want to go to the gig. Here are some others. You can also use an ‘either/or’ question in the same way. When answering a question like that, it’s impossible to say ‘no’. Sure, you could say, ‘I don’t want to meet at either time’, and sometimes people will. But you eliminate the answer ‘no’ with an either/or question. ps how good is your week going to be? 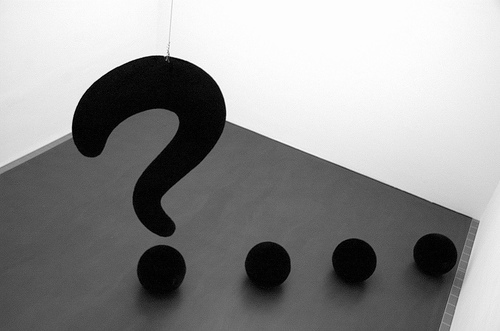 pps excellent question mark image by Stefan Baudy.